New leaked screenshots of what’s reportedly the upcoming Nokia Windows Phone 8.1 firmware have leaked. One of them suggests the firmware is going to be called Cherry Pink Blossom. Considering the previous two were also named after colors – Lumia and Black – that’s not too surprising. 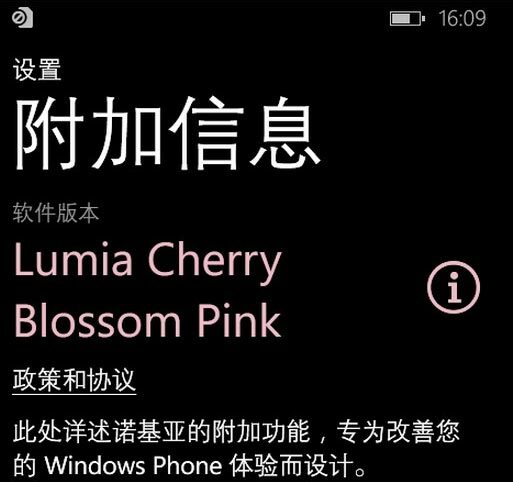 There aren’t many details regarding what Nokia plans to include in the Cherry Pink Blossom update at this time. Luckily, despite being in Chinese, the leaked screenshots give us some idea of what to expect. Below you can see how the quick toggles would look like as well as the notification center. The added VPN support as well as custom background for the Tiles screen is also shown. Many of the features are Microsoft’s doing and are going to be part of the Windows Phone 8.1 update. Microsoft will unveil the update next week at the Build 2014 conference starting April 2. Then, we’ll see everything the next version of Windows Phone will bring.